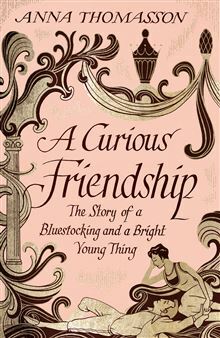 For the past few days, I've been engrossed in engaging new book, A Curious Friendship: The Story of a Bluestocking and a Bright Young Thing . Written by Anna Thomasson, the book recounts the unconventional friendship between writer Edith Olivier, the Victorian bluestocking of the book's subtitle, and the much younger artist, Rex Whistler. Although I am only a quarter of the way into the book (at 463 pages, it is lengthy), the text thus far is delightful. If you have an interest in either Olivier or Whistler, I highly recommend reading this book. By the way, I'd be remiss if I didn't mention the book's dust jacket, which has to be one of the most charming I've seen in some time. The cover art is fitting considering that Rex Whistler was renowned for his whimsical, sometimes fantastical, and always charming paintings and illustrations. 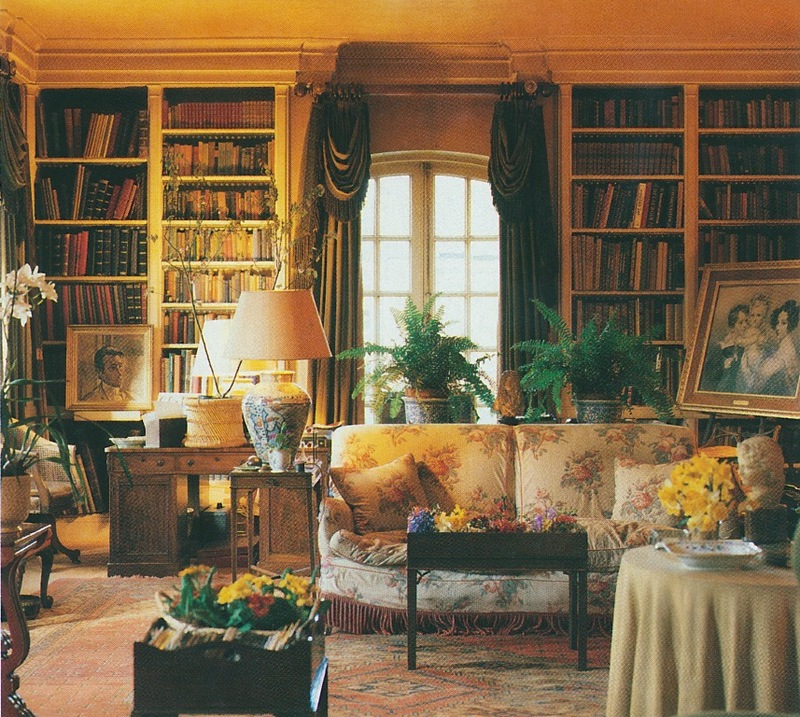 I spent some time finding examples of other rooms in which I would be quite happy to while away an afternoon or evening with my nose stuck in a good book. 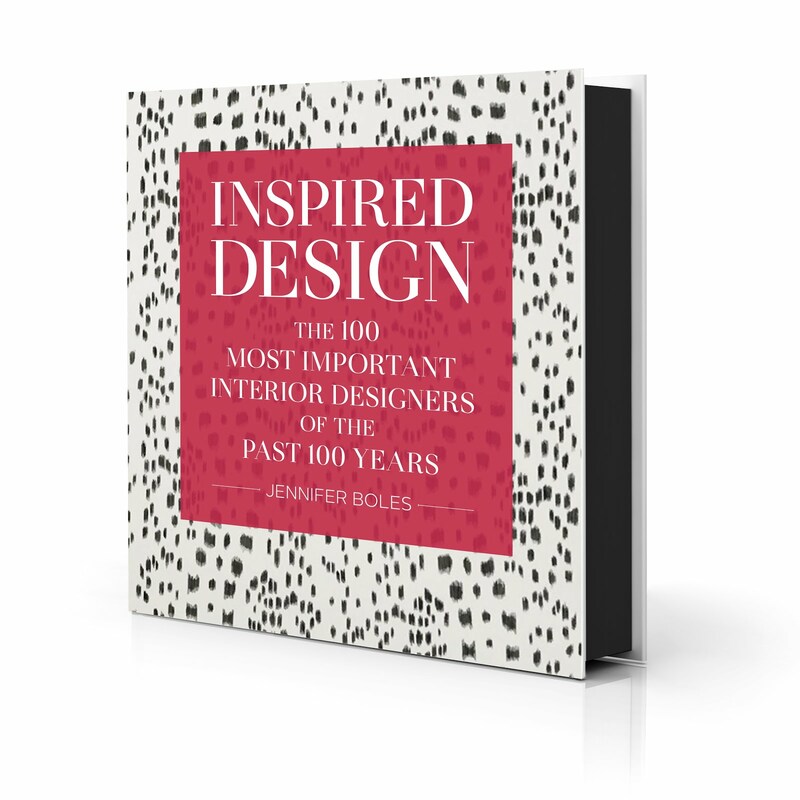 Some of the examples are sprightly, while others are a bit more serious, but what they all share is their ability to lure visitors into their clutches, either through deep, rich color or comfortable, nostalgic fabrics. And if you plan to lose yourself in a book, what better way to do so than in rooms designed beautifully for comfort and relaxation? Conversation Piece at the Daye House, painted by Rex Whistler in 1937. 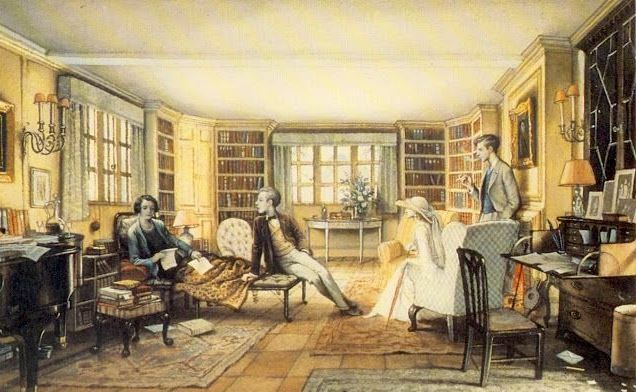 The painting depicts Edith Olivier, Lord David Cecil, Lady Ottoline Morrell, and Rex Whistler. The drawing room at the Dower House, Badminton. 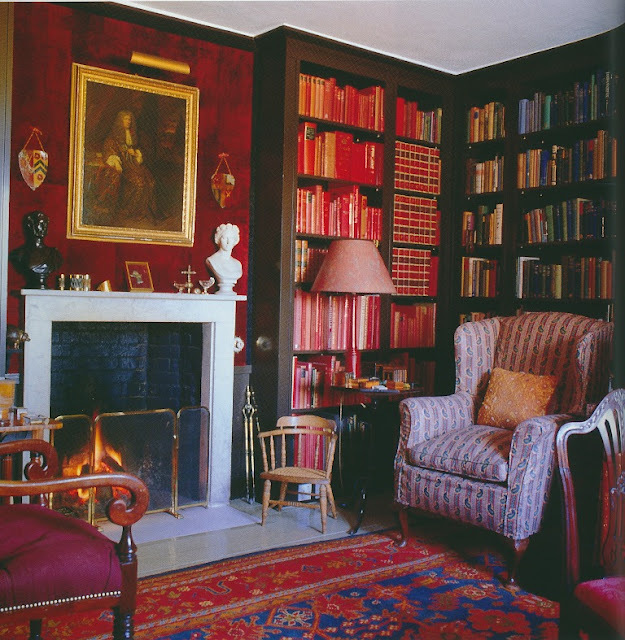 David Hicks's library in his Oxfordshire house. 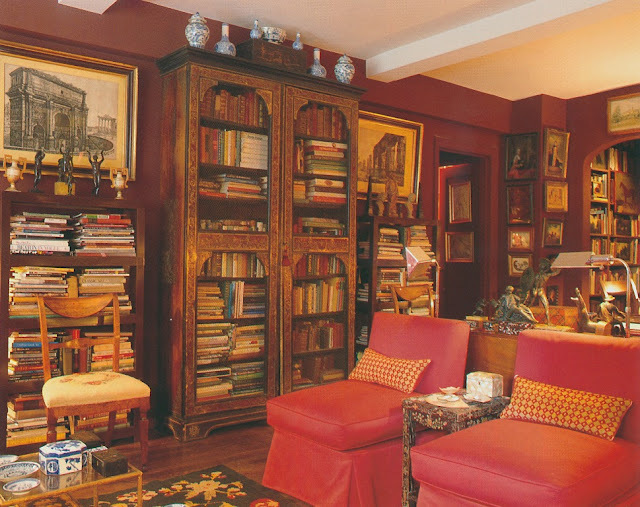 Scott Nelson's dressing room, located in the Manhattan apartment of Nelson and Alex Papachristidis, who decorated the room. 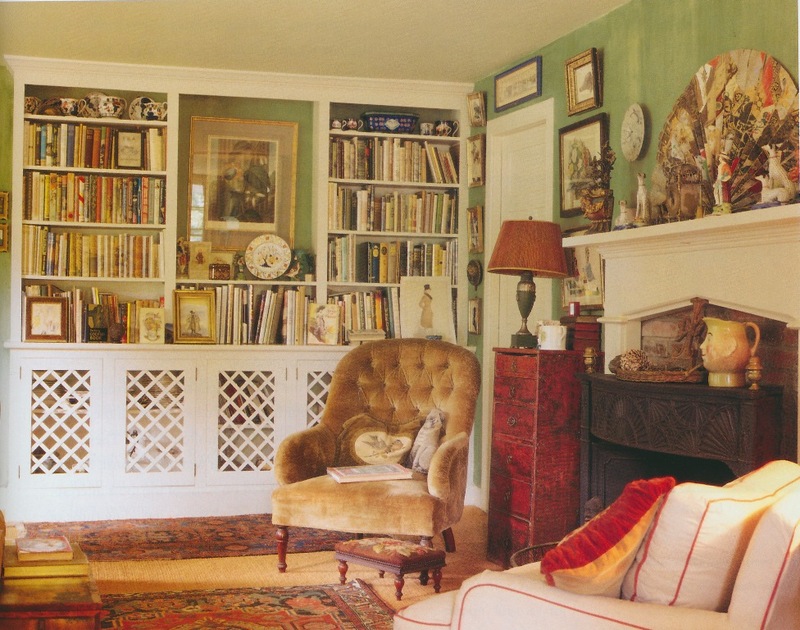 The living room in the country home of the late Timothy Mawson. The Manhattan living room of the late Stanley Barrows, design professor and historian extraordinaire. 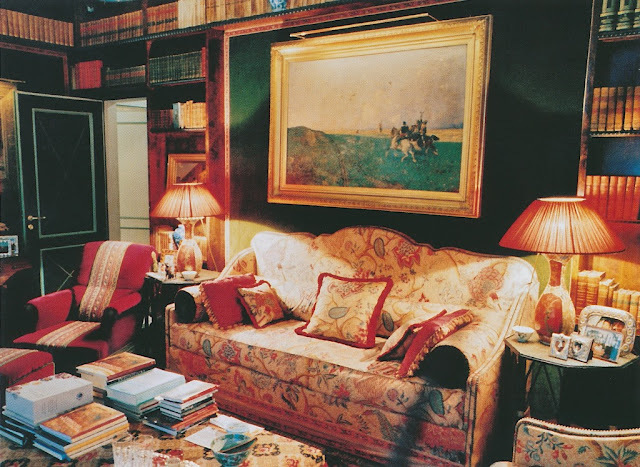 A cozy room decorated by Paolo Genta. 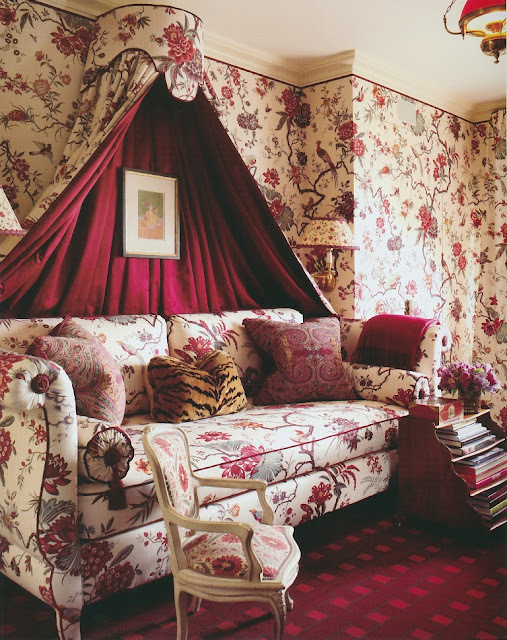 I do most of my reading on a daybed with a baldaquin and am looking forward to getting and reading this book. Thanks for the tip. Jennifer, a book I am putting at the top of my list! It sounds enchanting as are your images! Very gratifying to know that I'm not the only one who finds Rex's "Conversation Piece at the Daye House" so alluring. It's one of those little pictures that make one yearn to live in another era, with its own social possibilities. The platonic relationship of Rex Whistler and Edith Olivier has always intrigued me, so it's good to know that there's an entire book on the subject--not that Laurence Whistler's biography of Rex glossed over that friendship. 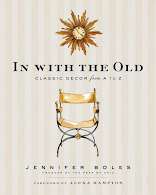 In any case, what a brilliant premise, Jennifer, for a post on rooms for relaxation and escape!